Since 1997, California’s Belzberg Architects has consistently delivered forward-thinking facade systems across North America. 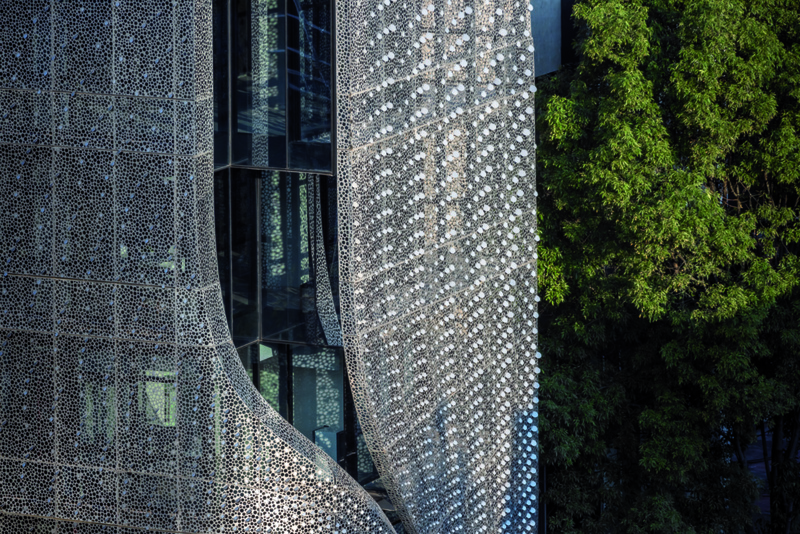 Profiles is a six-story commercial building draped in a diaphanous and perforated carbon-steel veil that partially resembling a stylish extraterrestrial ship landed in the heart of Mexico City. 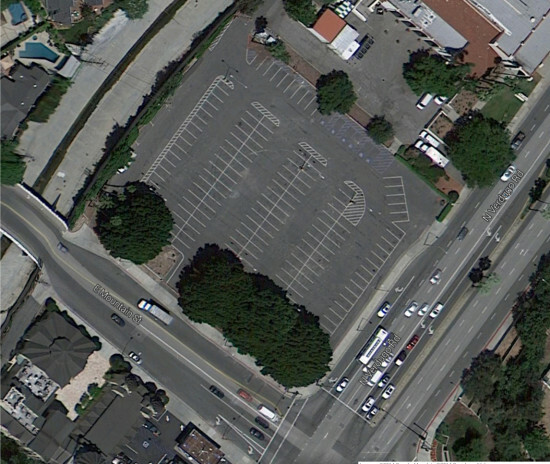 Profiles is located mid-block, surrounded by rows of predominantly three-to-five-story structures. The south elevation of the project is highly exposed by virtue of its height, providing Belzberg Architects the opportunity to play with the building's corner. The facade consists of a CR Glass–produced curtainwall shaded by a cloak of perforated carbon steel fabricated by El Roble. Walkways are located between the screen and the glass, providing a significant amount of elevated outdoor space for the building. The primary function of the carbon-steel veil is to serve as an exterior-shading device, and to this effect, the design team used a digital script to randomly distribute the perforations. "The holes were constrained to a specific range of diameters and with minimum dimensions for separation between edges," said Belzberg Architects. "The resultant quantity of holes was not significant for us from a design standpoint, but there was specific attention paid to the resultant open area as percentage. We targeted 50 percent open area to balance views out with effectiveness as exterior shading." Across the two elevations, circular segments of the perforated material remain attached as protruding disks. The protruding elements referred to by the designer as "chads," establish a dynamic effect over the facade; during the day they cast shadows across the building, while at night they reflect interior light for a lamp-like effect. Carbon steel, as opposed to steel or stainless steel, contains a greater proportion of carbon—up to 2.1 percent. As a result of this larger carbon content, carbon steel possesses a malleability highly suitable for undulating second skins. In total, over 450 carbon-steel panels—flat, single curved, and double curved—are draped over the facade. There are two standard dimensions for the panels: approximately four feet by three feet, and four feet by eight feet. Each panel is linked to a four-inch-by-four-inch hollow structural section via bolted connections. Although the facade was digitally designed and partially CNC-fabricated, significant segments required hand-bending; the chads had to be welded by hand. Double-curved panels were measured against CNC-milled formworks for accuracy. Profiles is one of five recently completed or underway projects by Belzberg Architects in Mexico City for developer Grupo Anima. 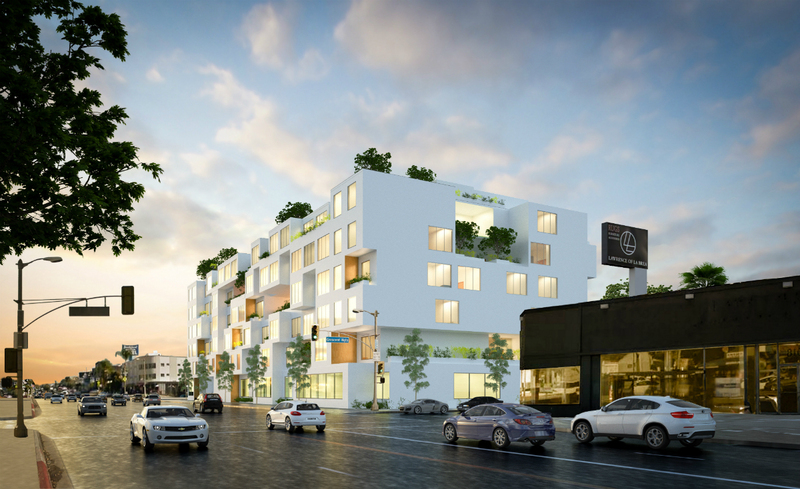 With a newly proposed plan for a 100-unit senior housing complex by Belzberg Architects, the Los Angeles Jewish Home (LAJH) is making clear its plans to expand outside the San Fernando Valley are serious. The LAJH, with over 1,000 residents, is already the largest single-source senior housing provider in Los Angeles. Still, it seems its latest expansion can’t come soon enough. Although LAJH has yet to wrap up construction on a new, Gensler-designed campus in the coastal Playa Vista neighborhood, all 199 units in that $100 million project have already been reserved. This recently-revealed proposal will provide 100 additional units in a second location a few miles away. The new mixed-use complex, located in the Beverly-Fairfax area in L.A.’s Westside, will feature 40 independent living, 40 assisted living, and 20 guest rooms in a structure that will also contain a new synagogue for the Orthodox Jewish Congregation of Beth-Israel and a Program of All-Inclusive Care for the Elderly (P.A.C.E) clinic that will be available for use by the public as well as residents. Belzberg Architects’s preliminary designs for the new six-story housing complex is a terraced apartment block whose pixelated, multi-planar facades step back from each street line to create terraces, balconies, and overhangs. Some of these areas turn the building’s corners, creating wrap-around mezzanines and loggia in a series of compositions that also include large, punched openings denoting individual apartment units. The similarly-variable ground level storefronts aim to activate the street while a rooftop terrace overlooks everything below. This approach mirrors LAJH’s Playa Vista outpost where neighborhood amenities include a library, gym, and community gathering spot. Evidently, the senior housing services provider is making a bet toward mixed-use development in an effort to keep its residents integrated with the wider community, and vice versa. According to materials released by LAJH, the mixed-use design aims to alleviate high rates of loneliness among the elderly population. The project’s public profile will surely get a boost from the P.A.C.E. clinic that both residents and community members age 55 and older will be able to use. The complex also contains a two-level, 137 stall parking garage. A timeline for construction has not been announced.